The area now known as Iwate Prefecture was inhabited by the Jōmon people who left their artifacts throughout the prefecture. For example, a large number of burial pits from the Middle Jōmon Period (2,800–1,900 BC) have been found in Nishida. Various sites from the Late Jōmon Period (1,900–1,300 BC) including Tateishi, Makumae and Hatten contain clay figurines, masks and ear and nose shaped clay artifacts. The Kunenbashi site in Kitakami City has yielded stone "swords", tablets and tools as well as clay figurines, earrings and potsherds from the Final Jōmon Period (1,300–300 BC). The earliest mention of a Japanese presence dates to about 630 when the Hakusan Shrine was said to have been built on Mt. Kanzan in what is now Hiraizumi. At this time various Japanese traders, hunters, adventurers, priests and criminals made their way to Iwate. 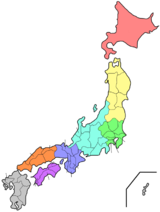 In 712 the province of Mutsu, containing all of Tōhoku, was divided into Dewa Province, the area west of the Ou Mountains and Mutsu Province. In 729 Kokuseki-ji Temple was founded in what is now Mizusawa Ward, Oshu City by the itinerant priest Gyōki. Little is known about relations between these Japanese frontiersmen and the native Emishi but in 776 they took a turn for the worse when large forces of the Yamato army invaded Iwate attacking the Isawa and Shiwa tribes in February and November of that year. More fighting occurred the next and following years but mostly in Dewa and the area south of present-day Iwate prefecture. This situation continued until March 787 when the Yamato army suffered a disastrous defeat in the Battle of Sufuse Village in what is now Mizusawa Ward, Oshu City. There the Emishi leaders and Aterui leading a large cavalry force trapped the Yamato infantry and pushed them into the Kitakami River where their heavy armour proved deadly. Over 1,000 soldiers drowned that day. The Japanese general Ki no Asami Kosami was "rebuked" by the Emperor Kanmu when he returned to Kyoto. Iwate faces the Pacific Ocean to the east with sheer, rocky cliffs along most of the shoreline interrupted by a few sandy beaches. 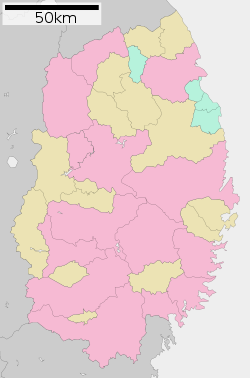 The border with Akita Prefecture on the west is generally formed by the highest points of the Ōu Mountains. 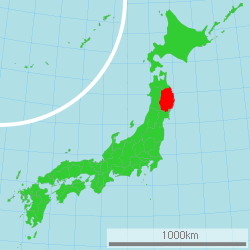 Aomori Prefecture is to the north and Miyagi Prefecture is to the south. The Ōu mountains on the west still contain active volcanoes such as Mt. Iwate (at 2,038 meters the highest point in the prefecture) and Mt. Kurikoma (1,627 meters). But the Kitakami Mountains running through the middle of the prefecture from north to south are much older and have not been active for thousands of years. Mt. Hayachine (1,917 meters) lies at the heart of the Kitakami range. Besides these two mountain ranges and the rugged coastline, the prefecture is characterized by the Kitakami River which flows from north to south between the Ōu and Kitakami mountain ranges. It is the fourth longest river in Japan and the longest in Tōhoku. The basin of the Kitakami is large and fertile providing room for the prefecture's largest cities, industrial parks and farms. In 1700, a tsunami from the 1700 Cascadia earthquake struck Iwate Prefecture. No records from North America exist, but the event was reconstructed using Japanese records. A panorama view of Jōdogahama in Miyako city. A view of Tono Country Village. The Takuboku Ishikawa Memorial Museum in Morioka. Sansa Odori, a one of famous for summer event in northern Honshu. ^ Frédéric, "Tōhoku" in Japan Encyclopedia, p. 970, at Google Books, p. 970. ^ Frédéric, "Morioka" in Japan Encyclopedia, p. 661, at Google Books, p. 661. ^ "【民話・昔話】鬼の手形". Bunka.pref.iwate.jp. Retrieved 7 June 2013. ^ Frédéric, "Provinces and prefectures" in Japan Encyclopedia, p. 780, at Google Books, p. 780. ^ "言い伝えられた平泉". Iwate Prefectural Office. Archived from the original on 13 October 2013. Retrieved 7 June 2013. ^ "General overview of area figures for Natural Parks by prefecture" (PDF). Ministry of the Environment. 1 April 2012. Retrieved 22 September 2013. ^ Schreiber, Mark, "Japan's food crisis goes beyond recent panic buying", The Japan Times, 17 April 2011, p. 9. ^ Kyodo News, "Sea Shepherd's return to Iwate town enrages local fishermen", The Japan Times, 26 May 2011, p. 2. ^ "27. Iwatesan" (PDF). Japan Meteorological Agency. ^ "38-meter-high tsunami triggered by March 11 quake: survey". Kyodo News. Archived from the original on 6 April 2011. Retrieved 7 June 2013. ^ Fukada, Takahiro (21 September 2011). "Iwate fisheries continue struggle to recover". The Japan Times. p. 3. Frédéric, Louis (2002 ). Japan Encyclopedia. Translated by Käthe Roth. Cambridge, Massachusetts: Harvard University Press. ISBN 0-674-01753-6, ISBN 978-0-674-01753-5. OCLC 58053128. Yiengpruksawan, Mimi Hall (1998). Hiraizumi: Buddhist Art and Regional Politics in Twelfth Century Japan. Cambridge, Massachusetts: Harvard University Press. ISBN 0674392051, ISBN 9780674392052. OCLC 38738867. Wikimedia Commons has media related to Iwate prefecture.